Villa 2 - 2BR/2BA in upscale complex - quiet and private owner managed retreat! VILLA TWO is located in an upscale beachfront complex located on the world famous Siesta Key. This villa is in one of the finest resorts on Siesta Key. Indulge yourself on beautiful white sandy beaches and at the edge of the blue Gulf waters - sun bask in the powerful tanning rays of the Gulf Coast. We provide outstanding customer Service to our renters. We are happy to assist you with any questions you may have during your stay. This extraordinary unit is only moments away from quaint shopping villages, fine dining and extraordinary cultural activities. This LIGHT and BRIGHT unit has a KITCHEN with GRANITE COUNTERTOPS and NATURAL STONE BACKSPLASH in natural colors in addition to stainless steel appliances. Villa TWO offers a spacious open floorplan which is nicely appointed furnishings including a 48" FLAT SCREEN TV. In addition, this unit also provides all the ameneties needed for an enjoyable stay. Tastefully appointed Master Bedroom with King Bed and Private Bath along with a 37' FLAT SCREEN TV. Guest Room with two twin Beds and adjacent bathroom. A full size futon is located in the sunroom. TV's are located in both bedrooms and the main living area. In addition, VILLA TWO has a 40' and 37' FLAT SCREEN TV and WASHER/DRYER, fully equipped kitchen, FREE WI FI (Wireless Internet). The unit also has a private garage for convenient parking. This Villa is an END unit with a nicely landscaped secluded GARDEN area providing a PRIVATE and QUIET setting for those relaxing evenings. This area is also perfect for active children - without the worry of elevators and balconies. A short stroll down the properties palm-lined drive provides you with PRIVATE and DIRECT ACCESS to the internationally acclaimed Crescent Beach that is know for the finest, whitest sand in the world. Beach and Pool CHAIRS are awaiting the arrival of Villa TWO Guests. Access keys for all common facilities are provided at the time of check-in. This complex has TWO pools for the use of our guests. One located beachside and the other clustered in the Villa area. SIESTA KEY - CRESCENT BEACH/SIESTA KEY was RATED #1 TOP BEACH IN U.S. on the National Geographic, TRAVEL CHANNEL and in the AAA Going Places Magazine. Keywords: Villa 2, Siesta Key,rental,VRBO 7065,CrystalSands Villa,2 Bedroom, 2 Bath two,#1 Beach,Top Beach,Villa 2,Villa Two,vacation rental siesta key,Siesta Key vacation rental,crescent beach,Florida vacations,Florida villa, Florida vacation rental, Florida vacation rental,luxury,VRBO 7065. The Slabaugh Family welcomes you to Villa Two. We live in Sarasota, Florida to provide you with outstanding customer service. We are happy to assist you with any questions you may have during your stay. We love the beach and all the activities that Siesta Key, Sarasota have to offer. We have a Dining Guide and Activity Book located in Villa Two which will help you plan your stay. We manage our unit directly giving our guests outstanding service. We have numerous return guests from all around the world. Check out our guest book in the unit. After growing up in the Sarasota area, we new that we wanted to provide our children with the beach memories that we grew up with on Siesta Key. The quiet and laid-back atmosphere of Siesta Key fits our personality perfectly. We enjoy this unit many times throughout each year so we maintain Villa 2 at a standard that we enjoy and expect when on vacation. The Villa 2 location is perfect for our family. We can relax and spread-out after a wonderful beach day in the secluded and private setting of villa two's end unit. Villa 2 is a stand-alone unit with a private garage - which is the only adjoining wall to another unit. Our guests DO NOT have to worry about the noise coming from surrounding units. Because of the quiet and private location of Villa 2 our guests are able to park directly at the unit with plenty of parking for friends. The convenience of our Villa offers easy entrance and exit without dealing with elevators and long hallways. Villa 2 has a WAHER/DRYER in the unit, FREE INTERNET, HD TV'S with cable package. Bring your cell phone - no land line available. Upscale beachside complex (#1 Beach in 2017 by TripAdvisor)! Private Garage and extra spaces at Unit. White Bath towels provided for guests. Beach towels provided for your use. Lawn and Garden area surrounds Villa 2. High speed Internet throughout - 42' HD Flat screen living 37' HD FLAT SCREEN master bedroom. 32' flat screen guest TV and WASHER/DRYER IN THE UNIT, Central Air Conditioning, Cable, Three TV's - Main TV is 42' HD Flat Screen/Masterbedroom has 37' HD Flat Screen/Guest room has 32' TV, Fully equipped Kitchen, private garage and laundry facilities, Two luxurious heated Pools, miles of Pristine White Beaches, Pool & Beach Chairs for all guests, Villa has been completely updated in all natural colors, This villa is maintained as a second home by the owners. Villa 2 is located at the entrance to Crystal Sands - it’s a very nice quiet spot with access to an almost private pool, and an easy walk to the beautiful beach! The reaort is also close to the south end bridge, which makes it easy to get on and off the Key. We enjoyed the great resources and restaurants off the Key as the Village is SO busy!! The resort location was also a plus as the traffic on the Key is heavy! The Villa is very cozy, well stocked, and beds are comfortable. We really enjoyed our stay and we’d rent Villa 2 again! Another great trip to Siesta Key! We have been visiting Siesta Key for a number of years, we really enjoyed our stay at Villa 2. This was our first stay at Crystal Sands and we are looking to book again for next year. We are glad you enjoyed Villa 2. Look forward to your next visit. We are happy you visited Siesta Key and stayed in VILLA 2. The 1250 sq. ft. of living space, private parking makes for a carefree vacation. It was a beautiful week and we know you enjoyed our award winning beach. We have a large number of return guests and hope to see you back soon. The villa is exactly as described: in the front of the property, about the equivalent of one long block to the beach (which is gorgeous with white sand and gentle waves). Kitchen was well stocked. Large TVs with cable, books to read, and a couple of games. Plenty of bath and beach towels. The entire villa was exceptionally clean. The property had plenty of beach chairs and loungers available, and 2 pools. We walked to most meals, and took the free Siesta Key trolley to see both ends of the island. I highly recommend Spearfish Grille and Orange Octopus Ice Cream. Thanks for the wonderful, relaxing stay! The private and quiet location of Villa 2 is special, we are happy that you enjoyed Villa 2.. Our beautifully landscaped grounds makes for an enjoyable stroll to the private Villa pool, secure beach access and the gulf-side pool. 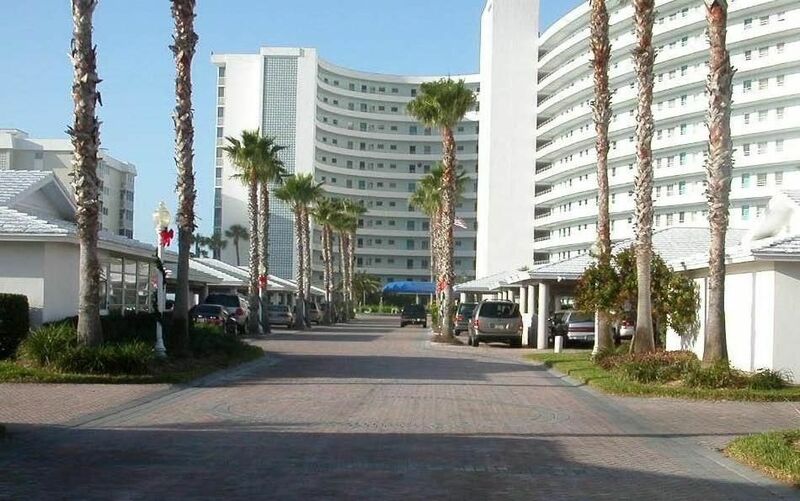 Our complex has one of the largest beach areas on Key. The Free trolley has been a great addition to the community! See you back soon. Villa 2 is a separate unit away from the Crystal Sands main high rise that you see in pictures. It is on the property but located near the front. The walk to the beach is 5 min. There is a huge bonus to this location though. At this end of the property is the second pool which is tucked away, almost hidden, very nicely only 100 yards from Villa 2. It is rarely used. We loved this. We would stop there on our way back from beach and just chill for a bit (happy hour optional!). The unit was very clean. Beds very comfortable including in the master. Very nice stand up shower in Master. Plenty of extra linen which came in very handy for us with 3 girls. Spare bedroom with twin beds were great and spare bathroom had nice tub. Great having full kitchen as we stayed 2 full weeks and would eat in every other night. Another little-known fact is that (for those of us Midwesterners who love grilling) there is a community gas grill up by main tower available for use. I used that at least 6-7 times. On our 2 or 3rd day we noticed that we were having to mop up water at bottom of fridge every day to keep from flooding into Kitchen. I let Janet know that I thought the fridge may be dying and 2 days later a new fridge was delivered. That’s truly above and beyond service!! Everything you ever need is there. Janet had a great beach buggy with all the necessities. Including plenty of towels, beach toys, cooler, nice new large shade canopy etc. The beach is as advertised. Simply incredible. Beautiful white sand and clear water. Loved the sunsets. Beach has a nice family feel to it with very friendly people including the locals. We all know it rains every day in FL in summer. What is unique at Siesta Key (as the locals told us and held up to be true) was that on the Beach you could see rain off the coast and inland, but the beach remained sunny and dry!! We all go on trips like this for the Beach. You will not be disappointed. I am surely leaving out plenty of wonderful things. I will tell you this. It’s a great feeling going to someone’s beautiful home and having them be so helpful and accommodating during your stay. Janet was truly fantastic. Literally I would text her (silly simple questions) and she would reply with in just a few short minutes if not immediately. We are very thankful to Janet for letting us stay in her home and we made so many wonderful memories. Loved it and you will too!! God Bless! We are happy that you enjoyed your stay in VILLA 2. When we purchased our Villa we had two small children and realized the convenience of the garage and parking spaces directly in front of VILLA 2 was very important for beach toys, groceries, golf clubs, luggage, etc. The short walk down the beautiful complex lane was welcome over the use elevators or stairs in a high-rise setting. Our retired clients also enjoy the one level living. The privacy of VILLA 2 along with the garden and grassy area and extra space around the unit was a bonus. Over the past 18 years the villa pool continues to be “the best kept secret”. We pride ourselves in customer service and for this reason the majority of our guests are return visitors (some returning for their 18th year this summer). We look forward to your next visit to VILLA 2 and Siesta Key! Condo clean, neat and just right. Very convenient access to the pool and the ocean. All beach accessories furnished. Exactly what we had in mind for a family vacay. Check in time: 3:00 pm Check out time: 10:00 am International Transaction Processing Fees apply Rate is based on FOUR guests of Villa 2. Rates are subject to change without notice. Jan. - April requires final payment at 120 days from arrival and cancellation 120 days prior to arrival. We suggest CSA Insurance for your rental.